I was born in Wimbledon, London, grew up in Claygate Surrey, and after completing a degree in German and English at Leeds University, went on to train and work as a journalist for 12 years. 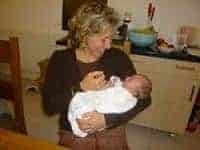 I had my first child, Constance in 2001, and it was as a result of her birth, which took place at the NHS midwife-run Edgware Birth Centre, that my career about-turned and I re-trained as a doula and active birth teacher. I had a doula present at the births of my next two children, which were at home in water, and these experiences only confirmed my feelings about how important this work was. I do not believe that a good birth comes down to luck, or the right-shaped pelvis or a high pain threshold. I believe every woman has all that she needs already, and that with the right birthing set-up, and the right reassuring support, she will be able to draw on all she has to bring her baby into the world. It troubles me that women are more fearful now than ever about childbirth, and in my work as a doula, I try to help with such feelings – not telling but really reminding women that in fact birth is natural, normal, involuntary – an extraordinary, but also ordinary event. I believe that when a woman in labour, has a knowing and experienced woman with her, she feels safe and she feels sure – and is more easily able to explore her limits. Supporting new mothers and their babies is a job I love. Whether I am preparing mum porridge or my ‘breastfeeding soup’ for lunch, or holding the baby while she has a shower, it is hugely satisfying. I breastfed my own three children for a year, but had difficulties at the outset and feel this experience helps me to support women who are also experiencing difficulties. I am a keen cook and like to bring my interest in making good nutritious food to bear in the job. I feel it is important to support the family as a whole as they adjust to all that is new, and do so whether it be by lifting the load from a practical/domestic point of view or offering guidance and reassurance over a pot of tea. I believe in raising awareness of the newborn’s point of view, highlighting their extreme sensitivity and vulnerability and thus the need for security, reassurance and comfort. As a birth doula, I offer two meetings prior to the birth, and one post, plus unlimited contact by phone and email. I am on call for two weeks before due date until the baby is born and attend the woman from the point she feels she wants me there until the baby is born. Postnatally, I work, mornings, afternoons or evenings, and charge twenty pounds an hour (min 2 hours). I am an active birth yoga teacher and run a regular weekly class in Barnes, South London (go to www.activebirthlondon.co.uk for more details).The class is held every Thursday, 6.30-8.30pm and through traditional yoga postures, gentle stretching, breathing and relaxation provides the women who attend with a powerful preparation for labour. As well as helping to build physical confidence and improve well-being in pregnancy, week–on-week practice really helps women to gain faith in their bodies andthe fact that birth is a normal, automatic process. I trained as an active birth teacher in 2003 with Janet Balaskas, founder of the Active Birth Centre and author of New Active Birth.The relaxation andbreathing I teach in the class help a lot when I come to supporting women in labour. I also do a pre-labour massage and relaxation treatment. I have a lot of experience of homebirth, especially using water. I have had experiences of prolonged posterior births or ‘back’ labour, which with the use of different positions and breathing techniques to keep the woman calm and paced, turned out to be very positive. I have also been involved with births that have involved medical interventions such asventouse and epidurals, births where the women felt satisfied and content with the outcomes because they remained ‘participants’ – where their choices were active choices and came from them. I have experience of Kingston, Chelsea & Westminster, St George’s, St Thomas’, St Mary’s, UCH and Queen Charlotte’s hospitals. I am extremely passionate about newborns and those fascinating, magical first hours and days when mother and baby are getting to know each other.